I haven’t shopped much for myself lately, but while I was perusing Zara’s online sale for Little V, I thought I’d give this red dress a try. I am not usually a maxi dress person, but now that I’m confined to wearing sneakers I appreciate the ability of the longer hem to cover up my active shoes. In a way, maxi dresses allow me to preserve part of my femininity when my usual uniform is denim or work out clothes. Mr. Wonderful recently had the day off, so we decided to savor the day by going up north to wine country while Little V was in daycare (does this make us bad parents?). It was hot! It’s amazing how a one hour drive can have a 20 degree weather difference. 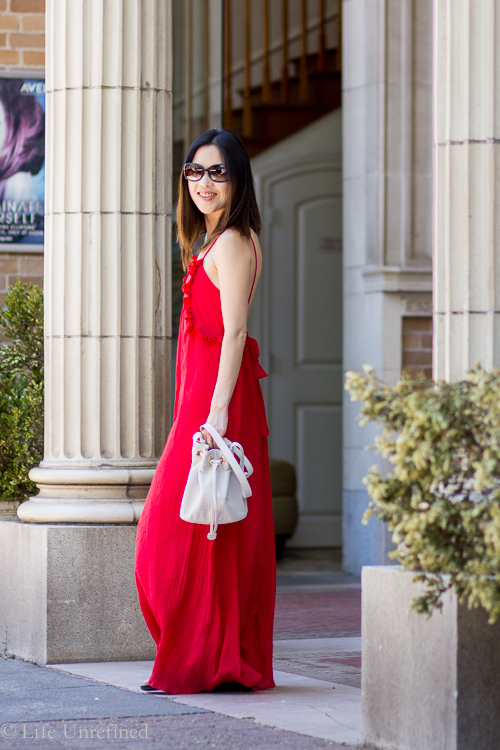 I was surprised at how the flowy nature and light fabric of this dress kept me relatively cool despite its long length. The Naked Pig. Located in Santa Rosa, this tiny restaurant is actually located on the parking lot of an old car repair shop. There are only a few tables inside and a few tables outside (literally on the parking lot), so even on a weekday morning the wait was about 30 minutes. The food was absolutely delicious though, especially the bacon waffle and homemade biscuits. Who doesn’t love carbs?! Ridge Winery. We couldn’t pass up a stop at our favorite winery in Sonoma. Their Zinfandels never fail to satisfy and pair well with so many everyday meals. De La Montanya. This was a winery recommended by some friends and the people that run it were absolutely warm and friendly. We picked up a delicious Syrah and Primitivo on this trip. Make a reservation on the weekends and pack a picnic lunch to enjoy in their pretty little garden. They also have a bocce ball court! The dress looks great on you and glad you were to enjoy a date day. We do it when we get the chance too so definitely don’t feel guilty about it! I love maxi dresses and skirts because I feel like they give the illusion of longer legs.